Soak dried apples in 3 1/2 cups apple juice for 30 minutes. Remove from juice, squeeze and reserve the soaking juice. Chop the apples and apricots into small pieces. Combine fruit, soaking juice, raisins and 1 cup water in a sauce pan. Simmer for 20 minutes. Add dissolved kuzu, stirring constantly until the mixture becomes thick and shiny. Add the dissolved miso with orange juice, spices, orange peel, mirin and walnuts. Simmer, constantly stirring for 3 to 5 minutes. Preheat the oven to 350°. Make the pie crust by first mixing the flours, salt and oil together with a fork or pastry blender until the flour forms small pebbles. Add the liquid all at once, mixing quickly, to form a ball of dough. Do not over mix or knead. Roll out the dough on a floured surface, forming a crust. Place crust in a 9" pie plate. Crimp edges and trim crust. Poke holes several places in the bottom of the crust with a fork to allow steam to release and prevent bubbling. Bake crust for 10 minutes. Remove and place filling in the crust. Bake for 25 minutes, until crusts is golden, remove and allow to cool before slicing. Variation: couscous can be used to make a pie crust. 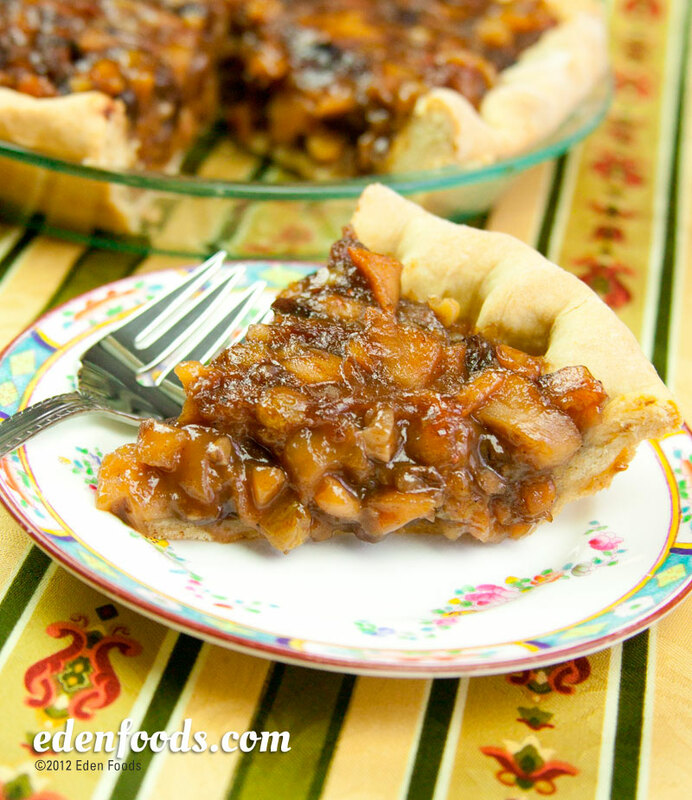 Please see Eden's recipe for Pie Crust - No Bake Couscous.